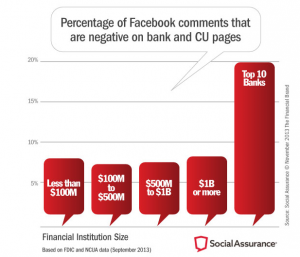 On December 11 2013, the FFIEC (Federal Financial Institutions Examination Council) published Social Media: Consumer Compliance Risk Management Guidelines, giving the banking industry its first overview with how social media can be successfully managed in a risk heavy industry. The guidelines do not impose new requirements; rather, they provide clear language on how institutions can operate in the social realm while adhering to existing laws and regulations for compliance and consumer protection. The guidance discusses the risks involved, both in reputation and in operation, in navigating in social. Although the larger banks received a copious amount of negative feedback as compared to the smaller banks, there are social solutions which these banks and credit unions should take note. Given the recommendations from the FFIEC report, banks should be creating cross-collaboration teams to provide new processes which support stronger customer engagement (responding to negative feedback) compliance regulation, streamlined procedures and eventually, direct revenue opportunity. Additionally, the need for an advanced infrastructure (tool) that can manage workflow, compliance & governance is now widely recognized by most of the banking industry, as 65% of responding banks plan on adopting new social management technology tools. The full FFIEC report can be accessed here.